The wall fountain can be used both indoors and outdoors, and it will be an essential artistic part for houses, offices, as well as tourist attractions. And it is quite helpful for the beauty of you surroundings, as well as relaxation. It flowing water can add healthful negative ions into the air, which is helpful for your mood and concentration. Besides, it can help to reduce dust particles and allergens, thus purifying environment and promoting physical and mental health. Also, it is capable of removing bothersome noises for you. And our wall fountain can be made of rock, patterned glass, stainless steel, etc. Its installation is quite simple: just put it on a flat vertical surface, and everything will be well done. As a professional manufacturer of wall fountain in China, Guangzhou Water Art Fountain Irrigation Garden Co., Ltd also provide many other water fountains, water features and fountain nozzles for clients around the world, including music fountain, programmed animated fountain, square fountain, floating fountain, waterfall feature, digital water curtain, creek water feature, indoor water fountain, direct jet nozzle, central upright fountain jet, morning glory nozzle, flower fountain jet, dandelion fountain nozzle, fog nozzle, fan nozzle, adjustable nozzle, water sphere and hemisphere nozzle, aerated nozzle, spring nozzle, etc. For all of our products, lifelong maintenance is available. We have built up lifelong cooperative relationship with customers from Malaysia, Brunei, Tajikistan, Saudi Arabia, UAE (United Arab Emirates), and many other countries in Central Asia and Southeast Asia. 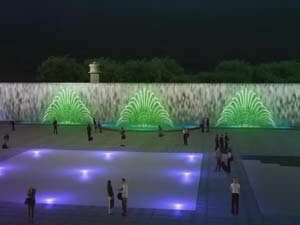 If you need our wall fountain, please do not hesitate to contact us. Waterfall FeatureThe waterfall feature can be used both indoors and outdoors. Normally, it is just a plastic mould which includes a pond and a terraced area. Digital Water CurtainThe water curtain is mainly used in parks, halls, terraces, bars, tea restaurants and so on. And it mainly utilized for decorating houses, separating space or matching room design.